Minnesota Twins 10, Angels 3 (10 innings). Postgame notes: A strange game caps a good series for the Angels. 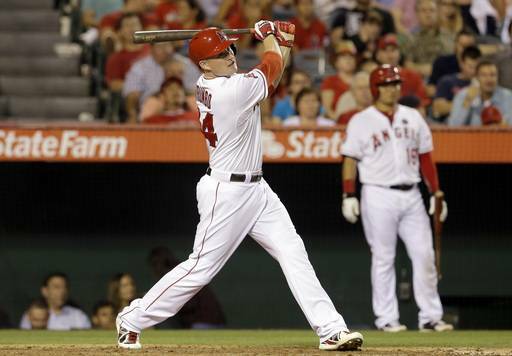 The Angels’ 10-9 win over the Seattle Mariners was fun for a night. As I pointed out in my game story, they did something that no team had never done, beating Felix Hernandez after falling behind by seven runs. Because it was such an anomaly it’s hard to extrapolate any long-term, big-picture ideas about what the win means for the Angels. Mike Scioscia tried. Mike Scioscia on Josh Hamilton’s boneheaded double-up. Angels manager Mike Scioscia was asked, naturally, about the play that ended the Angels’ 5-0 loss to the Houston Astros on Friday night. Josh Hamilton was doubled off first base when he rounded second, and reached third base, after Mark Trumbo popped out in foul territory with one out. Astros catcher Jason Castro lobbed a throw from just in front of the Angels dugout to second baseman Jose Altuve, who was covering first base, for the rare 2-4 double play. Was that a microcosm of everything that’s gone wrong in a 2-8 season? Postgame notes: A’s 11, Angels 5. This afternoon, Mike Scioscia bristled at the notion that he and reliever Sean Burnett were not on the same page about the non-blister on Burnett’s pitching hand Tuesday. After the game, an 11-5 loss to the Oakland A’s, the Angels did something that teams do when they need to get on the same page. They held a team meeting. From the outside, it’s easy to misconstrue team meetings as a red flag or a panic button. To the players inside a clubhouse, they’re typically constructive. So it was no surprise that Albert Pujols left Wednesday in what seemed to be an upbeat mood. “Everything always looks worse at the start of the year,” pitcher Joe Blanton said, and right now he couldn’t be more correct. So why hold a team meeting after eight games?